The Forged 3.5 inch Paring Knife is the mainstay of any knife set and belongs in any type of kitchen. It has a thin blade that tapers into a sharp point. This allows for a greater amount of control when performing intricate tasks. It can be used in place of a utility knife. Ice hardened German forged stainless steel. One-piece forging. Seamless polypropylene (POM) handle. NSF approved. Includes knife guard. "It is my favorite knife ever since I received it. I use it almost daily for everything in the kitchen. Both knives are very sharp, and came with a blade sheath to protect the blade.
. . . 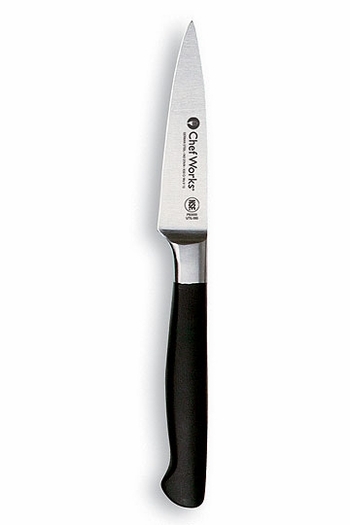 The knife rests comfortably in your hand, and has just the right amount of weight. I have had knives in the past that were just too light to be used for much. I love the way these fit and feel in my hand when I am using them.
. . . One other thing I like about these knives is that they are made in such a way that the blade is attached to the handle without a groove or slot where food residue can collect. . . It is made with a seamless polypropylene (POM) handle that fits perfectly to any size hand." Do you remember the age-old adage "Take time to smell the Roses"? A person is typically familiarized with this expression in childhood. If your childhood was, like many privileged children, ladened with care-free hours of cloud watching, enough spare time to search a green pasture for a four-leafed treasure, or afternoons with nothing better to do than string a crown of clover blossoms. You might have be left wondering why on earth anyone would need to be reminded to smell roses, an activity that seems as obviously routine as eating breakfast. But then life picks up the pace, starting slowly like an old steam locomotive, deliberately gaining momentum, constant propulsion, until within a mere decade life reaches a speed where passing events, celebrations, accomplishments and even milestones start to blur like the blades of grasses and shrubs that line the rails. And in the haze, the Rosebushes are often obscured. Karen, as wife, mother, grandmother and creative author of Fabgrandma.com, is helping us spot those precious Roses. She'll find you something sweet to taste, pulled fresh from the soil by the local farmer's hand. She'll direct your eyes skyward to catch a glimpse of something sure to take your breath, and stall your heart, - even if just for one beat. She'll remind you of the joy, pride and sense of accomplishment that come from creating. Crafting something from just an idea, to a stitch, then sewn into something remarkably beautiful. Karen pulls her grandmother's recipes from a handwritten cookbook and shows you, step by step, how to recreate a multi-cultural culinary delight. - to smell The Roses.